Create your own opportunities for success and be proactive in achieving your goals and dreams with this guided meditation and relaxation program, from certified hypnotherapist, Joel Thielke. The Sleep Learning System is specially designed to work with your subconscious mind during your sleep cycle. The guided meditation and soothing background music will deeply relax your body and mind for the perfect night's sleep, while allowing you to access the deepest parts of your mind. With this program, get the confidence and motivation you need be proactive, and develop a mindset that will help you attraction new opportunities for success. You'll feel well rested and energized when you wake up, and with every time you listen, you will feel more focused, motivate, and positive. Joel Thielke's guided mediation system gives you positive suggestions that will help you quiet your mind and melt away stress, leaving your body deeply relaxed for a great night's sleep. While you're sleeping, the program will remove negative thinking, fear, and self-doubt that may be holding you back from new opportunities, and help you develop a positive attitude so that you can manifest opportunity your way. 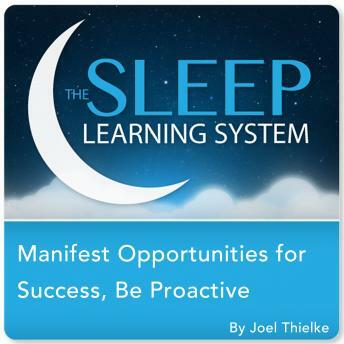 Create your own opportunities for success today with The Sleep Learning System!